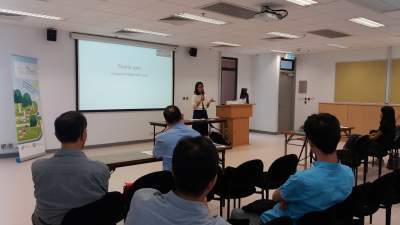 Dr. Sopitsuda Tongsopit, a researcher from Chulalongkorn University based in Bangkok, Thailand, was appointed a Visiting Research Fellow at the Asian Energy Studies Centre (AESC) from 9 to 14th September, 2016. As one of the main contributors of Thailand’s Solar PV Roadmap Initiative, Dr. Tongsopit described the major processes and outcomes of this 2 year deliberative initative at Seminar No. 6 of the Energy Research Seminar Series. This initiative consisted of a series of seminars and workshops with leading experts, business representatives, government officials, and other relevant stakeholders in Thailand, where they deliberated over the vision and scenarios and identified the benefits and barriers on the path of the country’s solar PV development. Representatives from utility companies, consultancy firms, non-governmental organizations, businesses, and academia attended this seminar. A diverse audience attended Dr. Tongsopit’s seminar on “20 Gigawatts of Solar PV in 20 Years in Thailand” on 12th September, 2016. Dr. Tongsopit presented to over 40 students in the guest lecture in the course on “Energy, Environment, and Sustainability” on 13th September, 2016. 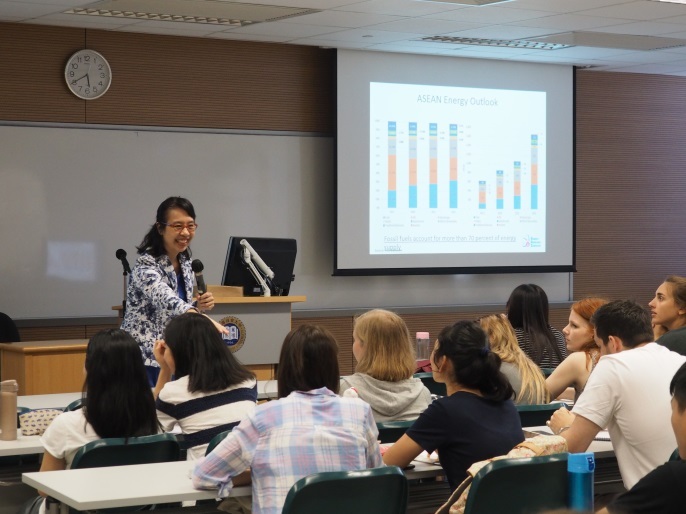 Dr. Tongsopit delivered a stimulating guest lecture to over 40 students in the introductory course, “Energy, Environment, and Sustainability”. First, she presented an overview of the importance of energy security and difficulty in moving towards a low-carbon energy transition for ASEAN (Association for South East Asian Nations) countries. And second, she discussed some of the major global solar PV trends, and made reference to the case of emerging solar PV developments and business models in Thailand. AESC is a university-supported Category-II research centre based in the Faculty of Social Sciences at Hong Kong Baptist University, and aims to be an internationally recognised hub for sustainable energy studies on the Asian region. To learn more about AESC and the Visiting Research Fellowship program, please visit http://aesc.hkbu.edu.hk/.